LOUIS VUITTON Sunset Boulevard _ Monogram Vernis enamel BRD (23041 brand:LOUIS VUITTON size:Possession: 50 / Machi: 2.5 / Height: 11.5 / Width: 24 (cm) Please contact us for product details. Model louise-ew-patent-leather NM M51634. MPN M51634. SKU BF338501. Material Patent leather. Type Clutch bag. Inner Pocket Open pocket 2 Zipper pocket 1. Size (HxWxD) 13.5cm x 25cm x 4.5cm / 5.31" x 9.84" x 1.77". 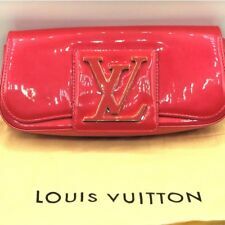 Louis Vuitton- “Sobe” model clutch bag. fuchsia pink patent leather. dust bag, booklet, and card. made in Italy. magnetic fastener.